Ceropegia woodii is a good hanging plant with long, pendulous stems and small heart-shaped leaves. Leaves are dark green and marbled with silver. String of Hearts is native to S. Rhodesia and S. Africa. Blooming Time: Summer-Fall. Flowers resemble small upturned vases. They are 1 inch tall and bulbous at the base. Culture: Ceropegia woodii need full sun to partial shade with some protection from the hot midday sun. The temperature should never go below 60° F in winter. In the greenhouse, we use a soil mix consisting of 1 part peat moss to 1 part loam to 2 parts sand or perlite. Water carefully, and be sure to let the soil become dry in between waterings. The container should have drainage holes as the roots may rot if they stay too wet. Fertilize monthly from May thru August with a balanced fertilizer diluted to ½ the strength recommended on the label. From November to March, water sparingly; do not fertilize during this rest period. The plant does best if crowded, so repot only when necessary. Repotting is done in April before new growth starts. Propagation: Ceropegia woodii is propagated by cuttings, by small tubers that are produced at the base of the leaves, and by seed. 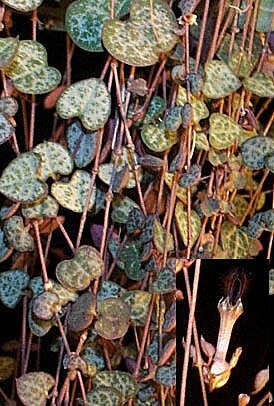 Ceropegia woodii was featured as Plant of the Week October 6-12, 2000.